No matter what role you are playing in traffic, it is imperative to give traveling your full attention. In a world of distracted drivers—as well as pedestrians and everyone else—accidents happen all too easily, and often they could be so easily prevented. Distracted drivers cause accidents that kill thousands each year, according to the National Highway Traffic Safety Administration. While motorists talking on their phones account for far too many distracted driving incidents, texting is a serious problem too, along with other cell phone issues such as surfing the net and fiddling with navigational applications. Other factors may come into play at different times of day too, when traffic is extremely congested, weather is poor, or visibility is low. The general rule should be for everyone to practice extreme caution in areas where there are traffic lights and crosswalks. According to the CDC, pedestrians are one and half more times likely to be killed in traffic than those traveling in cars. Their statistics for 2015 showed that 5,376 pedestrians were killed, while 129,000 were injured. CDC data also shows that of those deaths, 19 percent of the individuals were seniors, while one in five were children under 15 years old. Nearly half of the accidents involved alcohol somehow, and excessive speed was often to blame too. If you or a loved one have been injured as a pedestrian due to the negligence of others, contact the attorneys at Heintz & Becker. We’ve helped victims from Bradenton, Sarasota, and all over Florida get compensation for their damages and medical expenses after accidents. Call us for a free consultation now at 941-748-2916 or contact us online. We are here to help! The motorcycle industry is one that earns billions of dollars each year from adventurous consumers ready to hit the highways and byways, enjoying the thrill of adrenaline and riding in the fresh air. You may find yourself amazed at the beauty of some of the bikes on the road too, with that shiny Harley rumbling next to you at a red light bearing a price tag far greater than your sedan. There are also many bikes on the road targeting younger riders, priced for the millennial crowd as they become a growing part of the motorcyclist community. Motorcyclists span all ages and income levels, and as their vehicles of choice have risen in popularity, prejudice against them has given way to curiosity (and purchasing) for many. That doesn’t mean they have it any easier on the road though, with safety still being a major issue. Statistics cited by the Insurance Institute for Highway Safety show that 4,693 motorcyclists were killed in crashes in 2015 (comprising 13 percent of motor vehicle crashes), with 88,000 injured. Data also showed that ‘drivers of cruisers, standards, touring and sport-touring motorcycles’ were the least likely to be involved in crashes. While many motorcycle accidents occur without any involvement from another vehicle, other motorists are always a major safety problem due to their sheer numbers on the road, as well as the size and weight of their vehicles that can do serious damage in a crash. Motorcyclists, even with helmets on, are extremely vulnerable on the road. And while distracted drivers are a major issue today, one of the biggest problems for motorcyclists is visibility. Other motorists tend not see them, literally, as often the eyes are trained to watch for larger vehicles. Because of this, motorcyclists often employ different exercises to make themselves seen and heard—some of which you may have previously assumed they were only doing to show off; for instance, bikers may zigzag in their lanes, doing everything possible to make sure you see them—sometimes even seeking eye contact from your rear or side mirrors to know they have achieved that goal. They may also have to move from left to right depending on road conditions. Good safety also means wearing brightly colored clothing, keeping the headlights on, and following at a safe distance—unhidden from larger vehicles whenever possible. Just in case you don’t see them, motorcyclists will also honk their horns when in doubt, or rev their engines, and loudly. While this may seem annoying at times, it certainly gets attention! This is a good safety tactic at intersections, especially when motorists are preparing to turn and may not see motorcyclists about to be in their path. As a motorist, you can do your part to promote safety for motorcyclists by being especially cautious when turning, giving them more than enough space and avoiding hitting the brakes abruptly when possible, passing with care, and always looking beyond your blind spots while in traffic. Do you dread paying that annual or monthly car insurance payment? Most of us do, and at an average of $900 per policyholder per year, it is easy to see why; however, the reward of having insurance is feeling that sense of security, resting easy in thinking that insurance will cover any damage to our car. That is not always the case though, as a rising percentage of motorists driving along the highway with you are not carrying insurance. This means that if they hit you and cause damage, your policy will only pay out if you have your own collision insurance. To make matters worse, insurance rates continue to climb for everyone else due to the costs incurred in the US by uninsured drivers. CBS News recently outlined the growing issue of uninsured motorists in Florida, stating that not only are 27 percent of motorists without insurance – that is twice the average in the US for the uninsured, usually at one in eight. For Floridians, this spells trouble for many who are involved in accidents due to the negligence of another. You may find yourself paying around $67 extra per month in your insurance policy to make up for all those uninsured motorists—and their numbers have risen recently to 13 percent, with no signs of slowing down. Fines apparently are not enough to stop the problem in its tracks, with many uninsured motorists gaining the prerequisite coverage just long enough to buy a car and then dropping it within a very short period. It has been suggested that following suit with states like Oklahoma could make a difference. After instituting the practice of taking the license plates of those without insurance, Oklahoma saw a significant drop in uninsured motorists. Have you or a loved one been injured in a car or motorcycle accident due to the negligence of others who are uninsured? Please call Heintz & Becker for a free consultation with one of our personal injury attorneys. We handle all types of Florida personal injury cases, and our law firm has established an impressive record of verdicts and settlements. If you have been seriously injured, call us now at 941-748-2916 or contact us online. We are here to help! DUIs: How Many Does It Take to Keep a Repeat Offender Off the Road for Good? We know so much more today about the hazards of drunk driving than we did several decades ago, and because of that, such accidents have declined significantly. Data from the CDC shows, however, that there are still unacceptable numbers of drivers under the influence on the roads, wreaking havoc by causing injuries and fatalities that should not have happened. Over the years, laws regarding DUIs have become stricter, with Florida doing their part to try and stop drunk driving. The problem is that no matter how much education (or threat of consequences) is available, individuals under the influence often do not practice good judgment, meaning that they may get behind the wheel after drinking or taking drugs (whether legal or illegal)—and sometimes even after they have been convicted of one or more DUIs. Not only is judgment impaired but so are motor skills, vision, and reaction time, making their driving an extremely risky venture for everyone. Consequences for driving under the influence are meant to be strict not only to punish offenders but to make it clear to others that they should not get behind the wheel unless they are sober—and this begins with the youngest of drivers. In Florida, there is ‘zero tolerance for drivers under 21,’ with a blood alcohol level of .02 or higher resulting in a six-month suspension of the license automatically. Those over 21 are tested for blood alcohol levels over .08 if there is suspicion of driving under the influence. You may have heard before that it is expensive to go through such a legal ordeal, and that is true. Offenders must calculate court fines, fees to hire legal help, and of course, skyrocketing car insurance. Community service, probation, and even imprisonment is possible. Second offenses may mean loss of license for up to five years, along with all the same penalties, but with the possibility of longer time in jail and even higher fines. If the driver’s license is returned after an extended period of time (usually on a restricted basis), an Ignition Interlock Device (IID) is required (see more on these devices and their effectiveness in our recent blog, ‘Ignition Interlock Devices Keep Drunk Drivers off the Roads.’). Subsequent DUIs usually result in mandatory jail time, suspension of the license for as long as ten years, and other serious penalties. Those responsible for fatalities may lose their licenses for at least five years, or permanently, with steep fines and prison time. Data from the CDC shows that there is nearly one death per hour due to drunk driving accidents. While it is encouraging to see that progress is being made regarding keeping drunk drivers off the road in the US, those numbers are still alarming. Not only that, these accidents (making up a third of car accidents) end up costing over $44 billion annually. Find out more about drunk driving statistics here. If you or your child have been injured in a car accident due to the negligence of another driver or someone was under the influence, please call Heintz & Becker for a free consultation with one of our car accident attorneys. We handle all types of Florida personal injury cases, and our law firm has established an impressive record of verdicts and settlements. If you have been seriously injured, call us now at 941-748-2916 or contact us online. We are here to help! Life before kids—and after—is a drastic comparison for most of us, and especially for those who have babies and toddlers in the house. Remember the days when you could open all your doors and drawers in one quick step, get into cabinets by merely pulling them open, keep kitchen knives in a wooden block on the counter, and leave electrical outlets uncovered throughout the entire house? Once the little ones become mobile, most homes descend into babyproofed lockdown mode. You may find yourself hurdling baby gates, clasping doorknobs ensconced in unwieldy plastic knobs, and trying to wrestle open cabinets, windows, and appliances that are suddenly tightly closed with a variety of plastic mechanisms. Safety for your child will extend into every area of your life, from interacting with others to walking, driving, traveling, and more. Shopping for new items becomes a major consideration too as you will need to make sure whatever you purchase is child-safe. And while that may be promised by retailers and manufacturers, sometimes that is not always the case, with some product defects delivering catastrophic results. Defective products not only offer the exact opposite of what we were seeking, often resulting in headaches and mess, but they can also be responsible for serious injuries—especially when chemical burns are involved. These types of injuries are hazardous for anyone to endure, but smaller children are at even greater risk for long-term consequences. To avoid such issues, make sure any product your child has exposure to is age appropriate and that any items requiring batteries are in good working order with new batteries tightly concealed in a separate compartment. The key to avoiding such a burn is to make sure your child avoids chemicals overall—making certain they have no access to defective products which may be leaking, or caustic liquids that may also cause poisoning. In the case of such an injury, contact your doctor immediately, as well as consulting with a law firm experienced in defective products cases like Heintz & Becker. Defective products can also cause burns from electrocution or fire, whether from electronics, household appliances, or more. Many other products can be choking hazards, as well as causing injury due to broken pieces, sharp metal edges, small magnetic parts that can fall off or be easily removed by small hands, and electronic, moving parts that may pinch or cause serious harm. It is always hoped that products and toys that are particularly dangerous to children will be recalled before anyone is harmed, but all too often that is not the case. You may find that a product you purchased does not function correctly—and presents hazard— due to design flaws, issues in manufacturing, or errors in assembly and more. If you or your child have been injured because of a product defect, you may be due damages for medical care, pain and suffering, and property damage. Contact ­­­­Heintz & Becker now. Our experienced product liability lawyers will fight to recover compensation on your behalf. We handle all types of Florida personal injury cases, and our law firm has established an impressive record of verdicts and settlements. If you have been seriously injured, call us now at 941-748-2916 or contact us online. We are here to help! We depend on road travel for so much. Most of us have a drive to work each day—which sometimes means commuting a considerable number of miles, dropping kids off and picking them back up, and often heading to events in the afternoons and evenings also. Sadly, it is not uncommon to see that at least one accident has happened as you travel along your way—and perhaps even more. With so many distracted drivers on the road and thousands of collisions occurring each day, safety is more important than ever. While adults must fend for themselves with defensive driving and a sense of vigilance while in traffic, children are another story altogether. Due to their smaller size and weight, children are more vulnerable than adults when involved in car accidents, although proper seating can eliminate danger significantly, as well as requiring that children 12 and under ride in the back. Statistics show motor vehicle accidents are the number one reason for deaths in children up to the age of 19. They can also be hit by cars too while acting as pedestrians, or just outside playing; in fact, kids just chasing a ball across the street is a common scenario for being struck by a car near home. Driveway incidents can be an unfortunate source of child injuries and fatalities also as parents back out of a garage or driveway without realizing the children are outside and in the path of the car. According to the National Safety Council, extra caution should always be taken near a school. This is a common area for injuries to occur due to children going into school or exiting in the afternoons in heavy traffic areas which may include distracted and speeding drivers, as well as school buses that may not see children. You can help with traffic safety near schools by being cautious and driving slowly through traffic zones, being careful at crosswalks, and watching your speed—waiting to pass when you are in less congested areas. Make sure your children understand about the dangers of being near moving vehicles, and that they are educated about traffic rules. If you or your child have been injured in a car accident due to the negligence of others, please call Heintz & Becker for a free consultation with one of our personal injury attorneys. We handle all types of Florida personal injury cases, and our law firm has established an impressive record of verdicts and settlements. If you have been seriously injured, call us now at 941-748-2916 or contact us online. We are here to help! There are so many benefits to allowing your children to ride their bikes to school—and especially if you are close by with nice bike paths along the way. The morning and afternoon rides give children a chance to establish independence, along with freeing parents from school traffic and waiting in the all-too-familiar carline. Not only must they navigate on their own back and forth and follow traffic rules, but they learn to be responsible about being on time, parking and locking their bikes and being responsible about their own property. The exercise quotient is just as important too, especially today when physical education is being cut in many schools, leaving kids without an outlet to get moving in the fresh air. Riding bikes can offer a great social outlet too as kids make new friends and begin meeting up to ride together, forming safe buddy systems. And while riding bikes as a form of transportation is a wonderful part of childhood for kids, unfortunately, there is the safety issue to worry about. This usually begins as soon as your child learns how to ride. It’s hard to know who feels more anxiety, the child or the parent, as kids begin the first bike ride without training wheels—often ending up with a skinned arm or knee (if they aren’t covered in protective padding from head to toe!). Always wearing a helmet – this will help avoid such injuries as concussion or traumatic brain injuries, which can have long-lasting health consequences. Understanding traffic rules – riding a bike to school should not be an option until you are sure your child understands how to follow a route, wait for lights and cross intersections, follow instructions from safety guards, and most importantly, use hand signals. Using a bell and lights when necessary – this allows the bicyclist to alert others of their presence with a loud bell, as well as using lights in poor weather, at dusk, or in the dark. Bicycle maintenance – younger children may need more help with this, but the seat should be at the proper height, tires should have the proper amount of air, and all the other components such as the brakes should be in good working order. Pack efficiently – make sure there is an area for books, a water bottle, and more, or better yet—a snugly fitting backpack that eliminates the need to worry about loose items flying away during the ride. There are thousands of injuries caused by bicyclists being hit by cars each year, and children can be particularly vulnerable—including when traveling on foot. If you or a loved one have been injured in a bicycle accident due to the negligence of others, contact the attorneys at Heintz & Becker. We’ve helped victims from Bradenton, Sarasota, and all over Florida get compensation for their damages and medical expenses after accidents. Call us for a free consultation now at 941-748-2916 or contact us online. We are here to help! 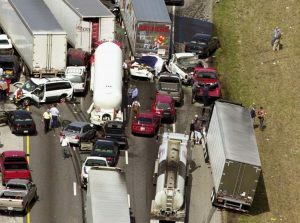 Multi-vehicle accidents often involve complicated liability questions that result in lengthy legal disputes. Multi-vehicle accidents involve statements from drivers and eyewitnesses, police reports, evidence collection, and multiple insurance companies. Because there are many working parts, these types of accidents generally benefit the aid of an experienced Florida car accident attorney. All Florida drivers are required to carry two types of insurance coverage: property damage liability (PDL) and personal injury protection (PIP). Property damage liability covers property damage caused by you; whereas personal injury protection covers you and others listed on a policy in the event of injury, regardless of who’s at fault—hence “no-fault” insurance. Florida’s no-fault rule was designed to lower monthly insurance premiums and reduce costly lawsuits through limited liability. Instead of negotiating with another driver’s insurance, no-fault insurance expedites payouts from a driver’s own insurance. However, the term “no-fault” is misleading since negligent drivers can still be held responsible for economic and noneconomic damages depending on the circumstances of the crash. This is especially true of multi-vehicle accidents that result in severe or catastrophic injury. In Florida, the minimum coverage for PIP insurance is $10,000; but that’s usually not enough to cover emergency services, hospitalization, or extended time away from work. Multi-vehicle accidents are often serious, especially when they involve large trucks like commercial motor vehicles (CMVs) or buses. According to the National Highway Traffic Safety Administration (NHTSA), Florida ranks third among all states for fatal accidents involving large trucks. When there’s been a serious accident or injury, victims can step outside the no-fault rule and file a civil lawsuit against the at-fault driver. In multi-vehicle accidents, this can be tricky. Filing a lawsuit is more complicated than pursuing a PIP claim though one’s insurance. In order to step outside Florida’s no-fault rules, certain criteria must be met, according to state statute. Assigning fault or pursuing compensation following a multi-vehicle accident is challenging since these accidents involve a series of actions/reactions from multiple drivers. Moreover, these accidents often require detailed investigation to uncover exactly what went wrong. Anyone involved in a multi-vehicle accident should be prepared to diligently document every medical expense, every doctor visit, and any time away from work. These details, as well as the police report and statements from drivers and eyewitnesses, will impact how fault is assigned and how much compensation is available. Liability, or fault, in Florida follows the rule of pure comparative negligence, which awards compensation to an injured person proportionate to his or her percentage of fault. Similarly, parties found responsible for a multi-vehicle accident are required to pay for his or her percentage of fault. Florida’s no-fault rules pose limitations over minor accidents that don’t rely on fault to pay out damages. However, assigning fault is a necessary mechanism in serious multi-vehicle accidents since these types of crashes often result in injuries that exceed Florida’s no-fault laws. If you’ve been in a multi-vehicle accident, you need a legal team that knows how to investigate these complicated cases. At Heintz & Becker, we’re dedicated to representing victims of negligence in Bradenton, Sarasota and the surrounding parts of Florida. With decades of combined experience, our team is prepared to carry the legal burden for victims and their families so they can focus on recovery. Call 941-748-2916 for a free case consultation; or tell us about the accident online to get started now. Road Safety Today: Are You Risking Your Life as a Motorcyclist on the Highway? Being safe is an issue throughout many aspects of our lives, from our time spent at home to our time spent at work and school. When we are on the roads, however, we must be diligent as just a few seconds spent in distraction can cause catastrophic results. Attention must be paid in every situation as wrecks can be caused by those driving too fast, too slow—or due to drivers who are not paying attention, are under the influence, exhausted, or more. This is all true for motorcyclists too, but doubly so, as they are rendered so much more vulnerable due to their lack of insulation in comparison to cars, absence of safety mechanisms like airbags, and proximity to the ground. Unfortunately, one of the greatest dangers to motorcycle enthusiasts is other drivers. If you own a bike, then you are probably all too aware of this problem. And while you cannot control the actions of others on the road, you can ride as defensively as possibly, making your presence known. Considering the number of accidents on today’s highways, we may all be risking our lives at times just by getting behind the wheel, but this is a much more serious consideration for motorcyclists, who are also at graver risk during weather conditions and areas where roads may be older and harder to navigate. Some drivers may be prejudiced against individuals who choose the motorcycle as their mode of transportation due to a variety of reasons, causing disrespect on the road—and sometimes, serious accidents due to careless actions like cutting riders off, following too closely or braking too quickly, and more. Unconscious actions on the road cause more problems, however, as motorists often fail to see motorcyclists—as well as others like joggers, walkers, and bicycle riders. This is generally because individuals driving cars are trained to look for vehicles of the same size, and they may miss others that do not take up as much room in their line of sight. Trained and experienced motorcycle riders are usually aware of the visibility problem and may work harder to make sure motorists see them (moving back and forth in lanes) as well as hear them (revving the engine). It is more important than ever to practice defensive driving if you are at an intersection or in oncoming traffic—and especially with cars making left-hand turns, sometimes failing to see motorcyclists and either hitting them or even just clipping them with devastating consequences. Cars that are not keeping a suitable amount of distance behind motorcyclists, or slamming on the brakes without realizing anyone is behind them are extremely hazardous—along with flinging open doors (and leaving them open) in parked areas, causing extreme danger and the potential for serious injury to those traveling on two wheels. Considering the amount of time most of us spend in our cars daily, it is to be expected that our moods and energy levels will vary. The problem is though that the roads—and traffic—can be unforgiving, and while we are driving, one hundred percent of our attention should be given to the task at hand. Although we may be a culture heavily involved in driving (and often immersed in traffic), the level of concentration given to that act sometimes seems to be an afterthought, evidenced by the thousands of lives taken by distracted driving each year. The issue of distracted driving has received a lot of press, beginning to equal that of campaigns against drunk driving. But one issue that is extremely common and can be just as deadly does not get the attention it needs: driving while exhausted. It is a busy world—especially for those of us who are juggling home lives with a long commute. Factor in a long and tiring day fueled by caffeine, evenings filled with more work, not enough sleep, and a vicious cycle begins. Unfortunately, far too many drivers are living this scenario, and if you are lucky enough not to be one of them, most likely you are still surrounded by them while driving. Tired drivers on the road may also be affected by drugs or alcohol, making them even more hazardous; however, just drowsiness alone can cause terrible consequences from behind the wheel. Drivers who fall asleep at the wheel can cause enormous devastation and damage, killing themselves as well as others. If you are feeling drowsy on the road, pull over to a safe area as soon as possible to avoid having an accident. Although you may think you can get to your destination without having an accident, your judgment may be impaired, attention span diminished, and reaction time sluggish. The CDC cites a study reporting that 1 in 25 adults said they had fallen asleep at the wheel within a thirty-day period. Along with that, the NHTSA states that drivers who are overly tired are responsible for tens of thousands of injuries each year—and while the exact numbers are unknown as cause is not always determined, as many as 6,000 fatalities may be caused on the roads by tired drivers.